Think you have an electrical problem? If your China ATV won't start, whether it's straight out of the crate, or seen its better day; there may be a quick fix. Often times we overlook the obvious. Next, let's check the battery to make sure it is fully charged enough to turn over the engine. On most China ATVs, the battery is located under the seat. A China ATV usually comes with a 1-2 amp trickle charger. If the battery is not strong enough to turn the engine, it definitely won't crank. While your here, check the connections. Make sure the positive(Red) and Negative (black) cables are tight. Also, on most Chinese powersports, there will be an in-line fuse that attaches to the positive cable. Make sure that this fuse is not visibly broken. It is made of glass and you can see the fuse inside. Also, check to make sure that it is snug in it's holder. Gas, Check. Battery, Check. Let's now make sure that the on/off switch located on the handlebar is in the on position. Make sure the key is in the on position. 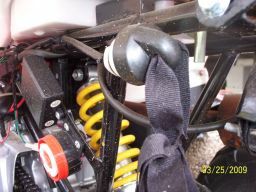 Most China ATV models have a safety feature that requires you to either squeeze or step on a brake lever to start them. Everything can be right, but if your quad has this feature and you don't do this, it will not crank. Another safety feature is sometimes located on the back of the 4 wheeler. Especially on smaller models, there may be a pull lanyard to shut the unit off. It should look like the one pictured. Even if it appears to be on, it has to be on tight to complete the circuit. Give it a push just to make sure. Now, if all of these items check out, your China ATV should be at leat trying to start. If it still does not start, try the following. The 3 things neccessary to make the ATV start are : Fuel, Spark, and Air. Take the spark plug out and put it back in its boot. Lay the side that would normally be in the engine ON the engine or frame. (It must be grounded.) Try to start it again and watch the plug for a light spark. Spark, Great! No spark, we'll get to that in a moment. If you have spark, but it still won't crank, your problem is most likely fuel related since the fuel/air mixture screw generally comes preset. Disconncet the fuel line from the carburetor to make sure fuel is getting to it. It's possible that something in the tank, line, or filter has it blocked. 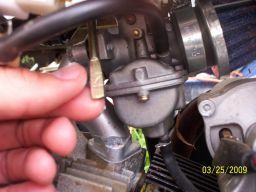 On one side of the carburetor, near the bottom, there is a tube that hangs and connects to nothing. This is the overflow. There will be a flathead screw on the other side of it. 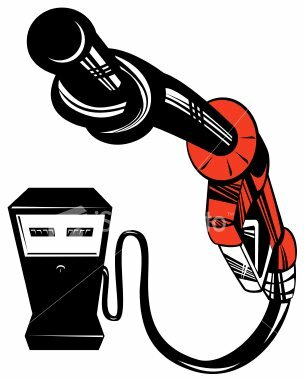 Loosen the screw to insure that fuel is indeed getting to the carburetor. Next, flip the choke lever(pictured) up. Try to start again. If it starts, let it run for a few seconds, then push the lever down. (off-choke) Click here to resolve other common problems. Still no spark? Still won't crank. Give all of the wires a quick check. Look carefully though. In shipping, sometimes they will wiggle loose and at first glance they look intact. Check all of the male/female plugs and connectors. If this still does not work, you may have an issue that needs dealer or manufacturer attention. Most all China ATV starting problems can be resolved by checking and double checking the items listed here!